Wishes come true in Rugrats in Paris The Movie, and love makes its way into the hearts of those young, old and overseas. Chuckie's dad, Chazz, starts dating again, and it's Chuckie's wish to find a new mom. When Stu Pickles is summoned to Reptarland, an amazing new amusement park in Paris, to work on his Reptar invention, Tommy, Chuckie, Angelica, Phil, Lil, Dil, Didi and the whole gang tag along to the city of romance. But the Rugrats' big adventure turns out to be more than glamour, fashion and smelly cheese. Chuckie learns that when it comes to princesses and potential mommies, things are not always what they seem, and for Chazz, finding the right woman can be difficult in any language. 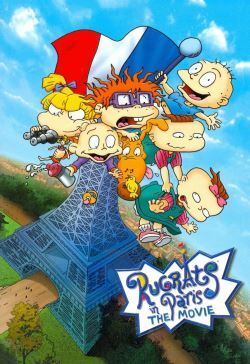 As the Rugrats' travels take them from the Eiffel Tower to Notre Dame and everywhere in between, the world's favorite babies learn new lessons about courage, loyalty, trust and above all, true love.